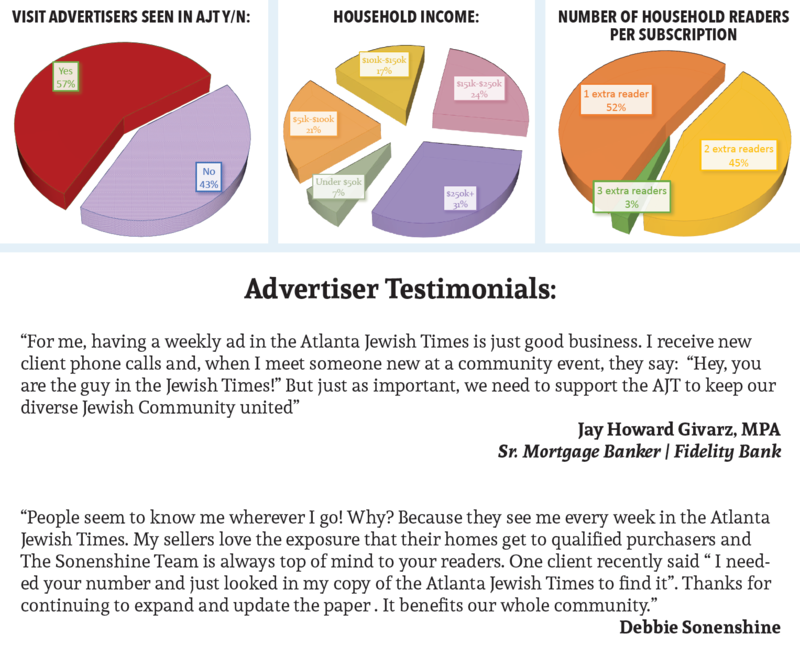 The Atlanta Jewish Times offers a full range of advertising options in print and online. For more information, submit your request below or call 404-883-2130 and speak to your Advertising Account Manager. Let us help you grow your business with a smart, strategic advertising campaign in the Atlanta Jewish Times and at atlantajewishtimes.timesofisrael.com. Over 50% of our readers frequent our advertisers. Over 55% of our readers have an income of $150,000 or more. Over 85% of our readers are college graduates, and over 50% have a master’s degree. Over 70% of our readers read the paper cover to cover each week. Please call the AJT at 404-883-2130, ext. 100, for Marketing & Communications inquiries. Contact your account manager for print and web rates and ad sizes. To request a copy of our media kit, contact your account manager or inquire below. If you have never advertised with the AJT before, please submit your information below and one of our Advertising specialists will get back to you soon.